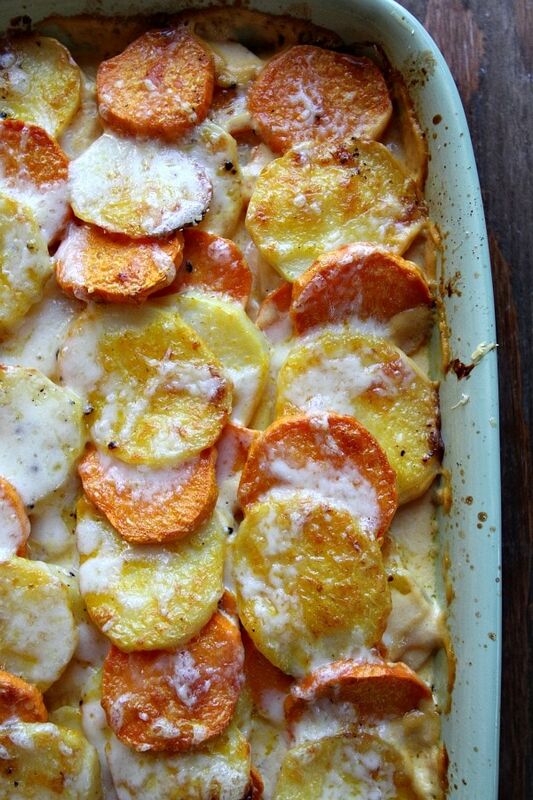 Here’s a recipe you must try- especially in the fall and winter months: Pumpkin Scalloped Potatoes. I’ve included a short video toward the end of this post showing you how to make this recipe. Watch that, and then print out the complete recipe below so you can make it at home! Finally it’s chilly BRRRRR!! here in Southern California. And by chilly (you might slap me upside the head if you live in colder climates) I mean it’s a high of 66 degrees during the day. That may seem pretty mild to folks who are already dropping snow in their neighborhoods, but I’m tellin’ ya that if you were here in my hood, you’d be putting on the fleece. The kind of cold we have in SoCal is a damp cold, which makes it feel pretty darn cold even at 66 degrees! The nights are tricky, since I’m freezing and my husband is hot, and I’m closing windows upstairs and he’s opening them downstairs, and it actually gets down to 40-ish degrees during the night and early morning hours. It’s a lovely battle to keep warm. Comfort food is just about the only thing that keeps me warm, so I’ve been making things like these pumpkin scalloped potatoes. 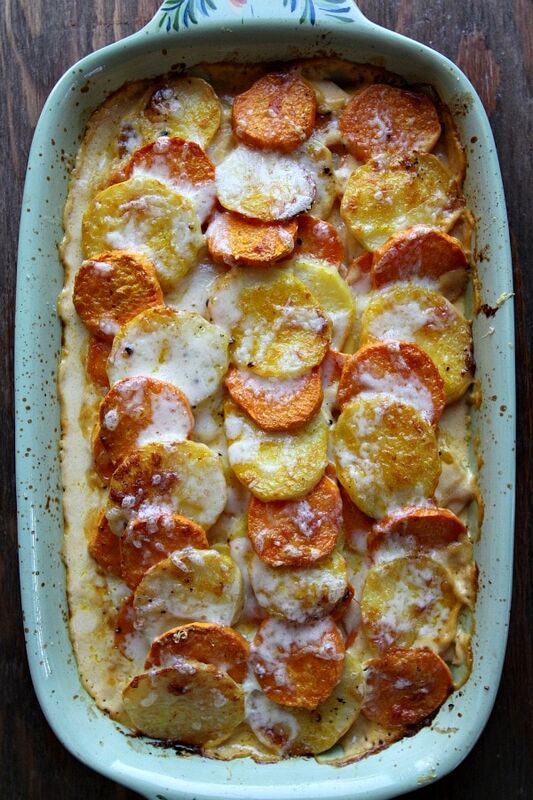 They’re a delightful dish of yams and Yukon Gold potatoes three-stories-high, layered with pumpkin cream and cheese. Piping hot out of the oven, these are delicious served with my Cape Cod Cranberry Meatloaf. Next day and the day-after-that leftovers are just as good. 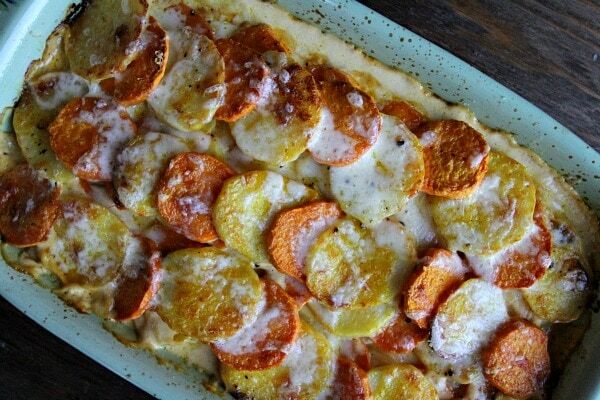 There’s a slightly sweet flavor to the dish- cream and pumpkin puree scented with fresh thyme and garlic covering two kinds of potatoes and baked with plenty of cheese. This is comfort food at its best. Maybe it’s that extra “padding” I took on from chowing down on that decadent cream sauce or perhaps it’s the warmth of dish itself… in any case, eating these cheesy potatoes worked to keep a girl warm (at least… until my husband opened those darn windows again). Click below to watch a short video showing you how to make this recipe, then scroll to the end to print out the complete recipe. Preheat the oven to 375 degrees F. Spray a 2 quart casserole dish with nonstick spray. In a medium saucepan, combine the cream, pumpkin, thyme, garlic and nutmeg and heat over medium-low heat. While the cream sauce is warming, prepare the potatoes. Create three rows of potatoes along the bottom of the dish, overlapping slightly and alternating the two types of potatoes. Sprinkle with salt and pepper. Remove the cream from heat (fishing out the thyme and garlic and discarding those) and spoon 1/3 of the cream sauce over the potatoes. Combine the two cheeses in a medium bowl. Sprinkle 1/3 of the cheeses over the potatoes too. Create a second layer of potatoes, sprinkle with salt and pepper and drizzle with 1/3 more of the sauce and 1/3 more of the cheese. 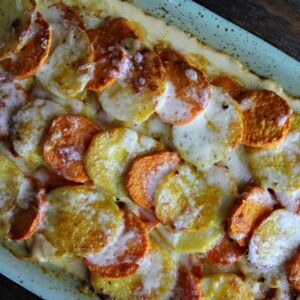 Create a third layer of potatoes, sprinkle with salt and pepper and drizzle with the remainder of the sauce. Bake the potatoes, uncovered, for 50 minutes. Sprinkle the remainder of the cheese on top, and bake for an additional 5 to 10 minutes, or until the cheese is slightly browned and bubbly.